" Woden" - Wood Fired Kiln - The bLog! Bill Crumbleholme working with a group of friends has constructed a kiln, based on Joe Finch's "Fast Fire" construction (see details at foot of this page). Although this is not exactly "bronze age" technology (like the rest of this website), it is a very traditional method of firing, which produces splendidly ancient looking wares! If you are interested in getting involved please send Bill an email and he will add you to his list of contacts. You will get alerts about special dates and also the details of how to book space in the kiln. 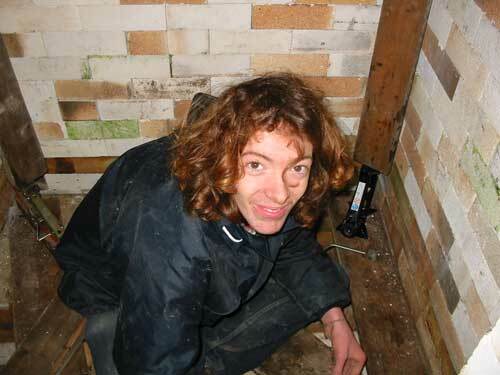 Bill will also send you a link to a Google Map showing the "secret" location of the kiln. If you want to come along with some pots and help fire them then check below to see the dates. the third firing on 26th May on this page. and the fourth firing on 11th September on this page. 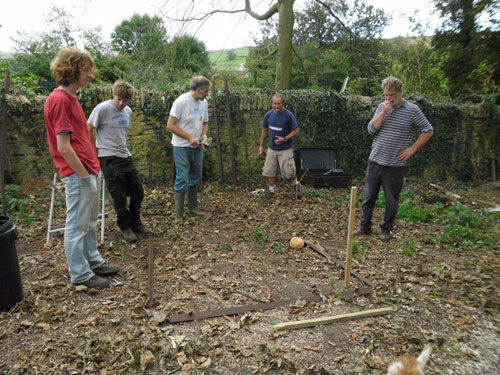 and the fifth firing in late November can be seen on this page. and the sixth firing in June 2013 can be seen on this page. and the seventh firing in August 2013 appears here. and the ninth firing in December 2013 appears here. and the tenth firing in May 2014 appears here. and the eleventh firing in July 2014 appears here. and the twelfth firing in October 2014 appears here. and the thirteenth firing in March 2015 appears here. and the fourteenth firing in July 2015 appears here. and the fifteenth firing in December 2015 appears here. and the sixteenth firing in April 2016 appears here. and the seventeenth firing in June 2016 appears here. and the eighteenth firing in November 2016 appears here. and the nineteenth firing in April 2017 appears here. and the twentieth firing in June 2017 appears here. and the twenty-first firing in November 2017 appears here. and the twenty-fifth firing in Novmber 2018 appears here. The next firing will be on 6th April 2019. The archive appears here. Then Mid June, if the potters casn make enough to keep filling it. The images and text on this page show the construction of the kiln, with the latest at the top, sort of blog-like! So start at the bottom and work up if you want to follow the sequence. The firing pages show more details of construction - particularly when changes were made to the original. 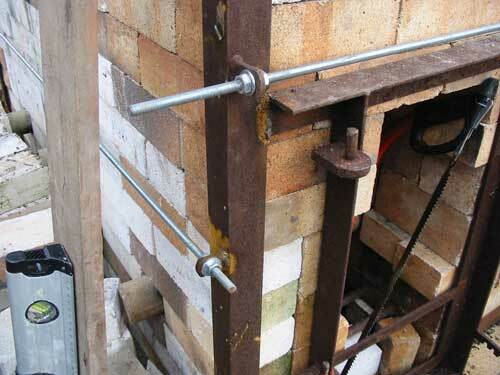 Such as the chimney replacement with brick and firebox alterations. 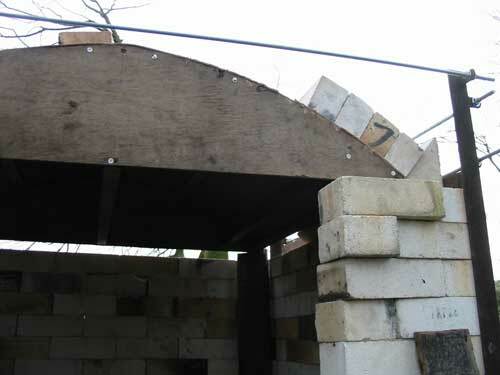 The front of the kiln, the arch spanning across the width. 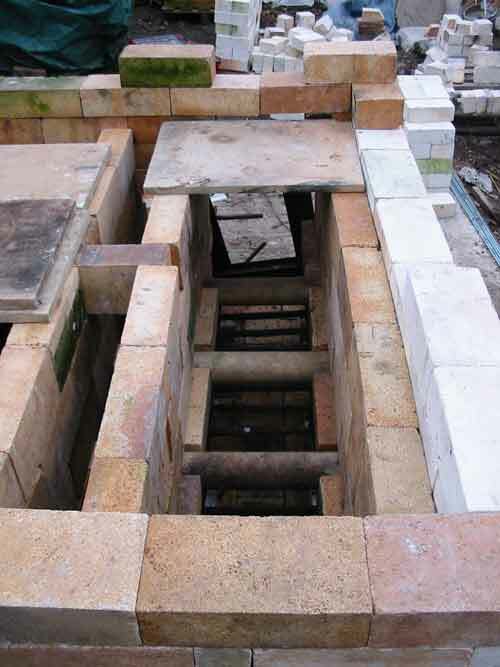 The door into the firing chamber is taken down and rebuilt for each firing, it is 3 bricks wide, but some half brick are used to stagger the joints, some are cut with a slight wedge, to enable them to be knocked down into line, with the wedge exerting some sideways force to jam the door into the main kiln walls, thus making it firmer. The door and the side walls are built up alongside the end of the arch, rather than having to fit in under it, which from previous experience is a real pain to do! This is the back wall of the kiln, with the arch above. This gable wall was built up alongside the end of the arch, capped with heavy bricks to provide some strength and protection. Laurence inside the kiln chamber, removing the props. The right hand sidfe front arch. 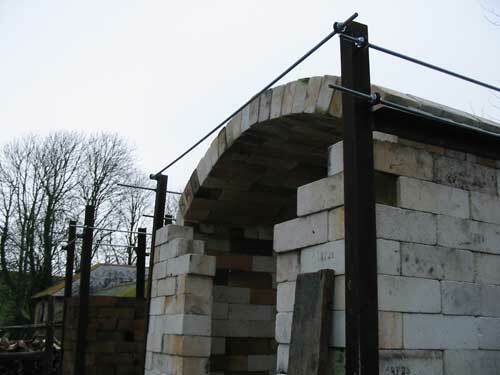 The spring bricks are cut off on the same slope as the arch, so that the layer of ceramic fibre insulation can drape over the arch and down the wall in one piece, without too much gap. The front left arch springer. This was taken just after the scary moment when the car jacks were lowered and the brick arch supported itself. The former was pulled out horizontally, before the rest of the front wall was built up. 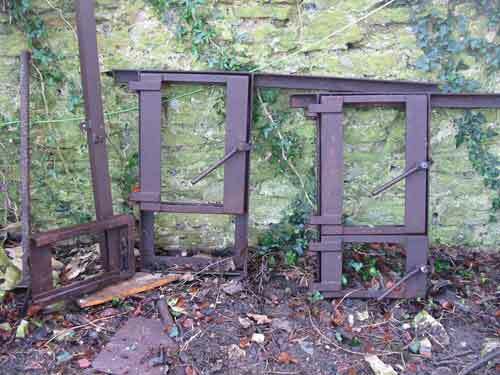 This shows the fire box frame (the doors have been removed), which has been welded to the uprights, the threaded bars pull the uprights together and keeps it all tight, the ends will be cut off when we are sure they are correct. The spirit level is only for show and served no practical purpose, everything was done by eye and tends to wander from the exact vertical/horizontal in places! The arch former has been propped up with struts of wood in each corner, those are each supported on a car jack which sits on the floor of the chamber. 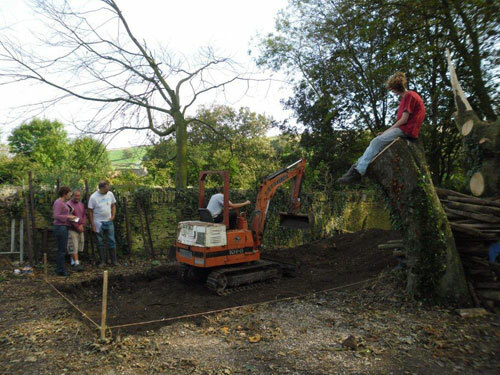 The jack can be used to adjust the height, indeed we raised the whole arch by an inch after most of it had been laid to enable the last course of arch bricks to be pushed into place. The chimney has been built and the main chamber walls are at bottom of arch height. The chimney will be extended by a temporary metal flue pipe perched on top of the brick stack - for the first two firings, then it was rebuilt completely in brick, see the third firing log for some images and text about this. 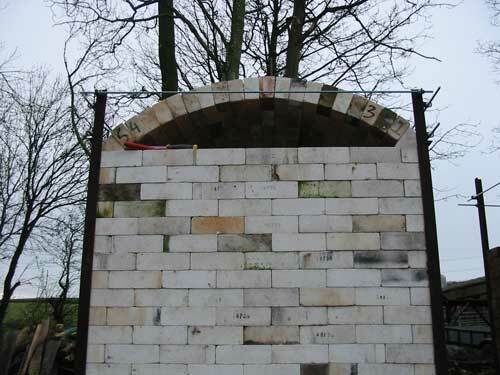 The wooden frame covered with hardboard has been placed on top of the kiln walls, ready to support the tapered arch bricks. Laurence is cutting springer bricks to shape. They sit on the top of the side walls, resting against the angle iron support - which stops them being pushed sideways by the arch. 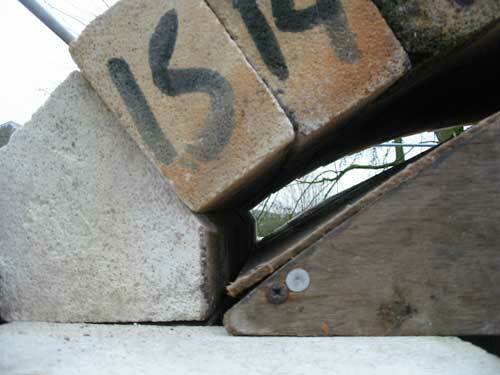 Back corner High Temperature Insulating (HTI) bricks, squeezed between the angle iron uprights at each corner. 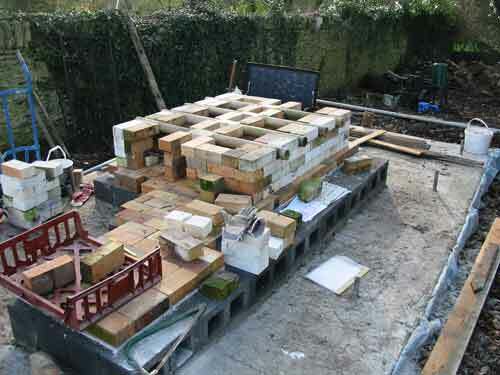 Each side is a complete number of bricks wide, plus a half brick to stagger the joints and tie in the corners. 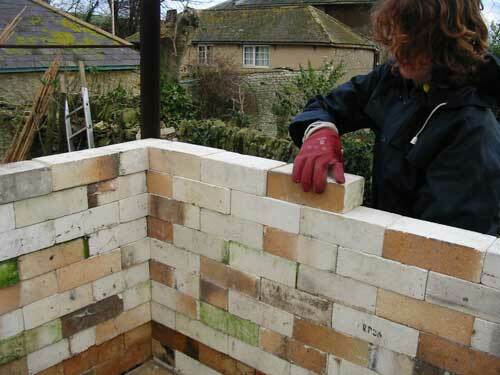 A quick job using the lightweight bricks, laid with no mortar and no cutting. Two thirds of the way up, even lanky Laurence can only just see over the wall! This shows a view into the firebox, with the kiln shelves being positioned over the front five sixths, the last sixth at the end away from the stoking end is where the flames will travel up into the kiln chamber. 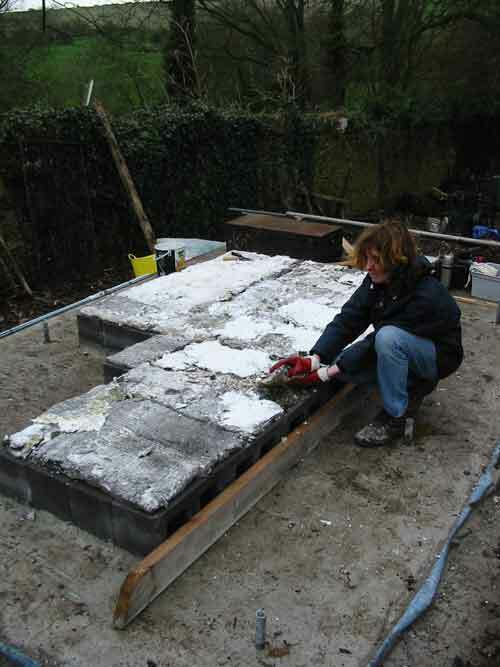 A layer of ceramic fibre will be laid over them and another layer of kiln shelves will be placed on top, with some brick supports along the edges. That double layer minimises cooling of the chamber from below, as cold air is drawn in. Note another brick has been placed across the exit flue, to stabilise the walls, hopefully this will not reduce the size of the flue too much. 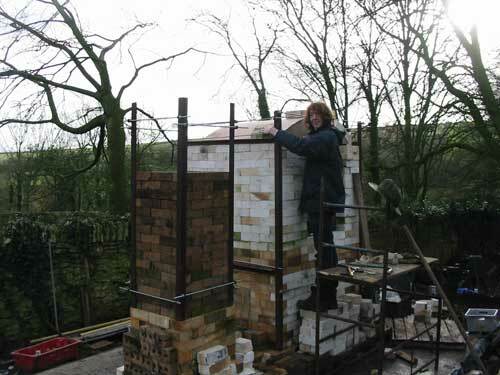 Kiln taking shape, we have reached the top of the fire boxes and have spanned across the top of the openings by corbelling the bricks - hopefully that will be sturdy enough. Joe suggests using a kiln shelf as reinforcement, but we did not do that. The firebox doors are checked for positioning and flatness agaist the kiln wall. Another view, showing the other end of the kiln. 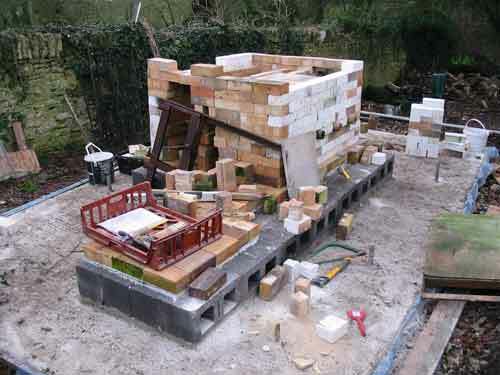 Note the 4 bricks at the base of the end of the firebox, these are a variation suggested by Joe Finch - they can be pulled out to enable ash to be cleared out more easily after the firing. View of the fire boxes, with large cylindrical kiln props in place, these are what the timber is put on to burn. They can be replaced if broken, by pulling out sideways. We modified the design by inserting bricks at the ends of them in the middle, this should seal the ends and also provide a strengthening link between the two middle walls. 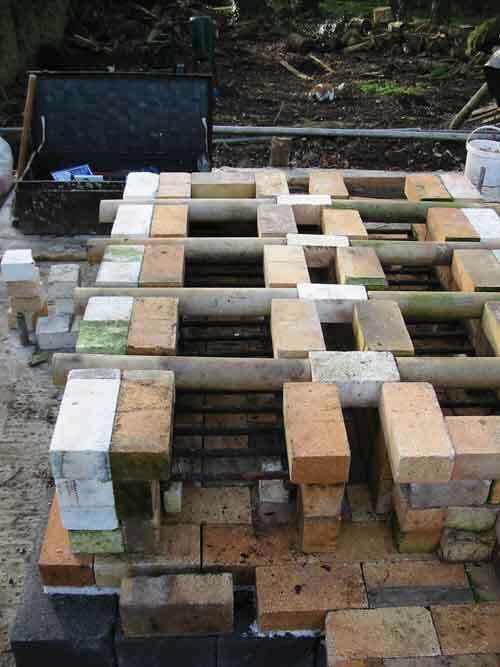 The bricks in that course have been laid flat, rather on edge, to keep the same height as the bars, some of the bricks on the next layer had to be notched a little over the bars to stop them wobbling and to allow the bars to be taken out if replacement becomes necessary. We have dry bedded all these, rather than using any mortar. The central gap is where the flue gases go down, the tunnel will join at the end of it and lead to the chimney. 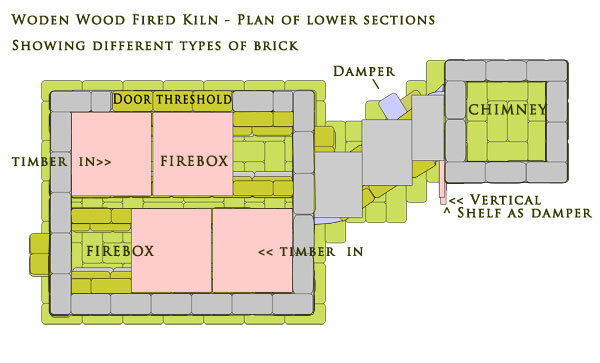 The first four courses of bricks, that form the bottom of the two fire boxes and the tunnel which leads to the chimney. There are iron grates one brick up from the base, these catch falling embers and hold them up so they burn more before falling further into the ashpit. That also forms the air inlets, below the burning fuel - so it burns efficiently. 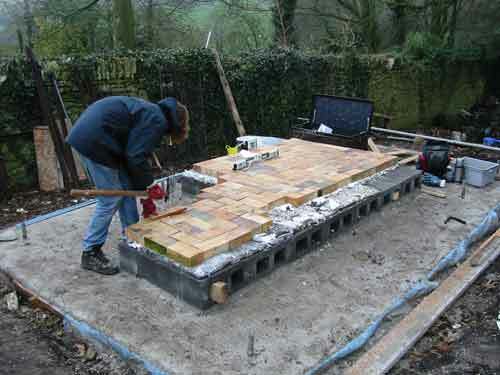 This is a layer of heavy firebricks laid over the ceramic fibre to form a base for the kiln and chimney. Laurence levelling out the secondhand ceramic fibre on top of the blocks. 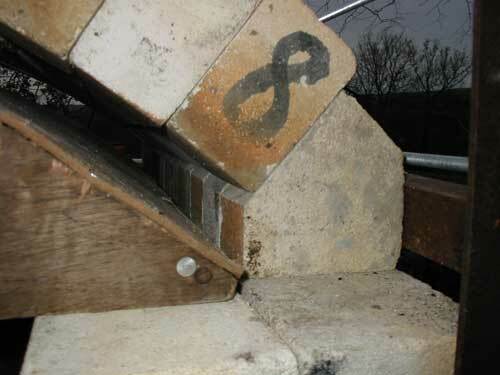 This provides some insulation below the base layer of heavy fire bricks. Subsequently we found some areas of the fibre compressed more than others when squashed flat by the weight of bricks above, so there was a bit of subsidence particularly in one corner - but not enough to worry about or start thinking about the Tower of Pisa! 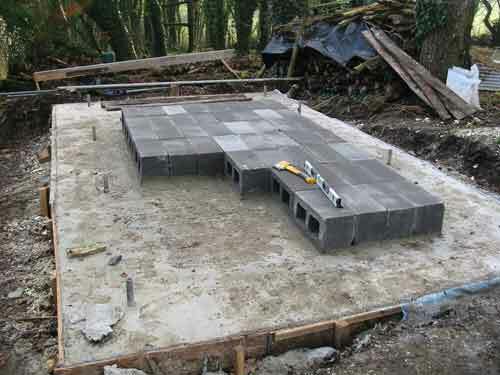 The first layer is hollow concrete blocks, laid on a bed of mortar, almost horizontally! The chimney will be built on the right hand corner near to where this was taken, the main firing chamber will be on the far end. This will be covered with ceramic fibre, we have plenty of second hand fibre needing a home, as we will buy new fibre for the main chamber insulation. 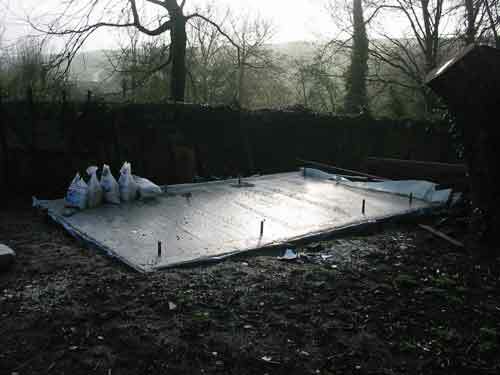 The concrete slab a week old, one damp November morning! The small poles sticking up are for the "shed" uprights to slot over, so they do not move. These are the fire box doors that came with the kiln "kit", they may need some slight alteration. 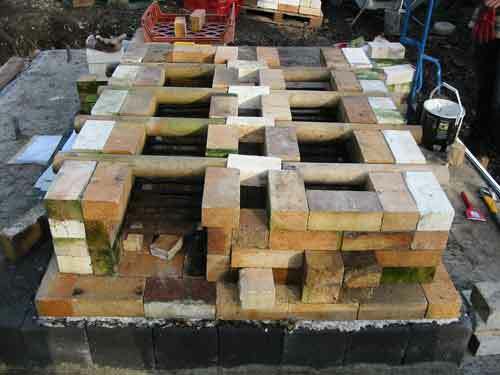 A set of secondhand basic kiln bricks and ironwork was purchased from a potter who made a kiln, fired it several times, took it all apart againand then left the country! It is being built at a "secret location", due to security issues. But the location is revealed to anyone who needs to know where it is! The plan is to encourage anybody to book cubic feet of space at a charge yet to be set and when enough space has been booked to fill the whole kiln then a firing date will be fixed. 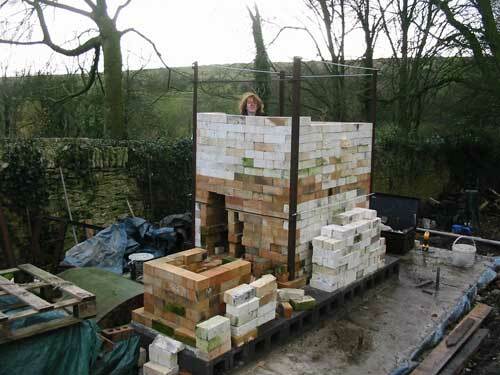 Then everyone can come along and help stack and fire the kiln. 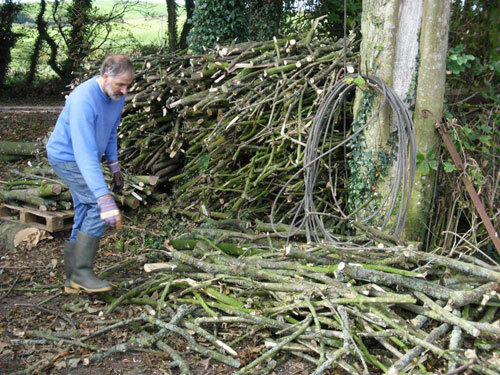 We have been collecting timber, from the trees that were cut down from the kiln site and also some dead elms from a nearby environmental project. But we are still on the look out for more suitable timber. This is the plan of the brick layouts, showing twin fireboxes, main chamber door and chimney. All these plans and images will be made available as a PDF files - after the first couple of firings! The name Woden was choosen for the kiln because it sounded right - research (Wiki!) has since confirmed its suitability - with references to an Anglo-Saxon god of fury and inspiration! Maybe the root of Father Christmas and Wodensday.